Yonatan Berg was born in 1981 in Jerusalem to a religious family and grew up in Psagot, a settlement in the West Bank. He gave up his religious lifestyle and now lives in Tel Aviv. Berg holds a BA in creative writing and an MA in bibliotherapy. A poet as well as a novelist, Berg writes a weekly opinion column for the popular Walla website and has written literary reviews for the Israeli press. He has published three books of poetry and was the youngest poet to receive the Yehuda Amichai poetry Prize for his debut book Hard Sails (2013). 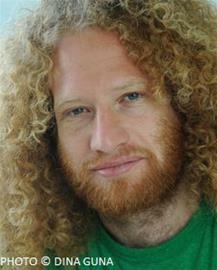 His short story, "Elegy", won the prestigious Haaretz short story competition. Five More Minutes, Berg's first novel, won Am Oved's 'All the Beginnings' competition (2012) and the Ministry of Culture Prize (2015). Berg also received the National Library of Israel's 2016/2017 scholarship to encourage young Israeli writers. He is currently working on his second novel.